Photograph of the Maharani of Sikkim from the 'Wheeler Collection: Portraits of Indian Rulers,' was taken possibly by Johnston and Hoffmann c.1900. Stephen Wheeler, the donor of the collection, was presumably related to J. Talboys Wheeler, organiser of the 1877 durbar and author of 'The History of the Imperial Assemblage at Delhi' (London, ). Full-length seated portrait of the Maharani of Sikkim, wife of Maharaja Thotab Namgue and stepmother of Maharaj Kumar Sidkyong Tulku. This photograph was possibly taken by John Claude White, c.1900 and marketed by Johnston & Hoffmann. The Maharaja of Sikkam's family originated from Lhasa in Tibet and settled in Sikkim in the mid 17th century. Puntso Namgye, the head of the family, was sent three Tibetan monks (professors of Myingmapa - the 'red cap' sect) to convert Lepchas of Sikkim to their sect of Buddhism. The descendants of Puntso Namgye became the Raja's of Sikkim. Photograph of Sardar Singh, Maharaja of Jodhpur from the 'Wheeler Collection: Portraits of Indian Rulers,' was taken by Gobindram and Oodeyram c.1900. Stephen Wheeler, the donor of the collection, was presumably related to J. Talboys Wheeler, organiser of the 1877 durbar and author of 'The History of the Imperial Assemblage at Delhi' (London, ). Jodhpur, ruled by the descendants of the Rathore Rajputs, was founded c.1450. Sardar Singh (1880-1911) succeeded as Maharaja in 1895 at the age of fifteen. Sardar Singh's uncle, Maharaj Pratap Singh and a council of regency assisted him for the first three years until he reached eighteen. Sardar Singh visited Europe in 1901, and is known for his involvement in extending the railway from Jodhpur to Hyderabad. Photograph of Kesri Singh, Thakur of Piploda from the 'Wheeler Collection: Portraits of Indian Rulers,' was taken by an unknown photographer in 1903. Stephen Wheeler, the donor of the collection, was presumably related to J. Talboys Wheeler, organiser of the 1877 durbar and author of 'The History of the Imperial Assemblage at Delhi' (London, ). Full-length standing portrait of Kesri Singh, Thakur of Piploda. Piploda, located in Rajasthan, was controlled by the Doria Rajputs and was founded by Shardul Singh in 1547. Kesri Singh, succeeded as chief of Piploda in 1887. 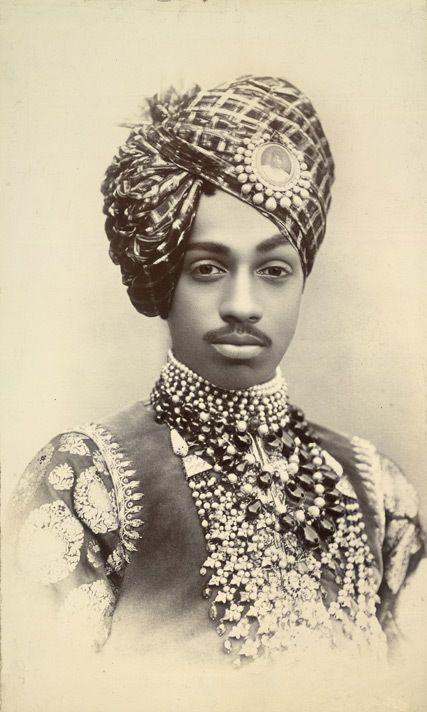 Photograph of Muhammad Hamidullah Khan, Nawab of Bhopal from the 'Wheeler Collection: Portraits of Indian Rulers,' was taken by an unknown photographer c.1900. Stephen Wheeler, the donor of the collection, was presumably related to J. Talboys Wheeler, organiser of the 1877 durbar and author of 'The History of the Imperial Assemblage at Delhi' (London, ). Bhopal, located in Madhya Pradesh, was founded as a state in 1723 and ruled by the descendants of the Afghan Dost Muhammad Khan. Muhammad Hamidullah Khan (1894-1949), succeeded as Nawab of Bhopal in 1926. Photograph of of Sir Arjun Singh, Raja of Narsinghgarh from the 'Wheeler Collection: Portraits of Indian Rulers,' taken by Herzog and Higgins c.1900. Born in 1887, Singh was appointed as Raja in 1897 at only ten years of age, gaining full ruling powers from the Government of India in 1909. Photograph of Sir Mir Mohammad Khan, Khan of Kalat from the 'Wheeler Collection: Portraits of Indian Rulers,' was taken by Frederick Bremner c.1894. Kalat is located in Baluchistan and was established in the middle of the fifteenth century by the Mir Wari clan, an Arab family.